It's never easy to make an impression withoutan elegant bouquet. Oriental Lilies cover thislarge bouquet in fragrant white and yellowblooms. They will be taken aback by thestunning size of this bouquet with 1 - 2 largeblooming heads on each stem. 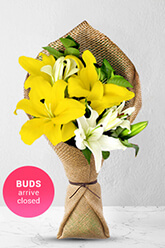 To ensure longlife, the flowers may arrive with some closedbuds which will soon open as fresh bloomsand create a lasting impression.Lilies may be sent closed/partially closed inorder to prevent damage and to last longer.Vase is not included however; for a lastingimpression we recommend a Superior Vasewhich is the ideal selection for this gift. Good retargeting of ads. Easy pre-filled forms. Timely delivery. However, you customer support is in Australia and there is no local number where you operate in. My daughter loved her flowers. She hasn't stopped talking about how beautiful they are! A dead in the family is never nice. I was worried for the delivery because my cousin liven in an apartment block, and how as this delivery going to go when she was not home. My worry was not necessary as the flowers were nicely left inside by the staircase. I am not sure how it all happened but it all went according to plan from accross the world. The person I sent has to on Thursday still not got there flowers. ?